Twin Falls midfielder Jaycee Bell and Century freshman Allison Horsley chase after a loose ball Saturday during the Great Basin Conference girls soccer title game at the Sunway Soccer Complex in Twin Falls. Twin Falls keeper Sidnee Naerebout saves a shot on the goal Saturday during the Great Basin Conference girls soccer title game at the Sunway Soccer Complex in Twin Falls. Twin Falls midfielder Reagan Rex and Century senior Ellie Surmelis fight for possession of the ball Saturday during the Great Basin Conference girls soccer title game at the Sunway Soccer Complex in Twin Falls. TWIN FALLS — On a cold, windy day at Sunway Soccer Complex, the conditions could have dictated the way in which the Great Basin Conference championship girls soccer game played out between Twin Falls High School and Century. Instead, one chance in front of goal was the determining factor. Less than five minutes into Saturday’s contest, Twin Falls senior Madison Hicks rounded Century goalkeeper Shelby Vasas and slotted the ball into the back of the net for a 1-0 advantage. That proved to be all the Bruins needed. Twin Falls added two goals in the second half and shut Century down, taking their fourth straight conference championship with a 3-0 victory. Although the goals eventually came, the Bruins (17-1) had to deal with the aftermath of Hicks’ score. Right away, Century (13-4) roared back with two chances from sophomore Emma Edgley. 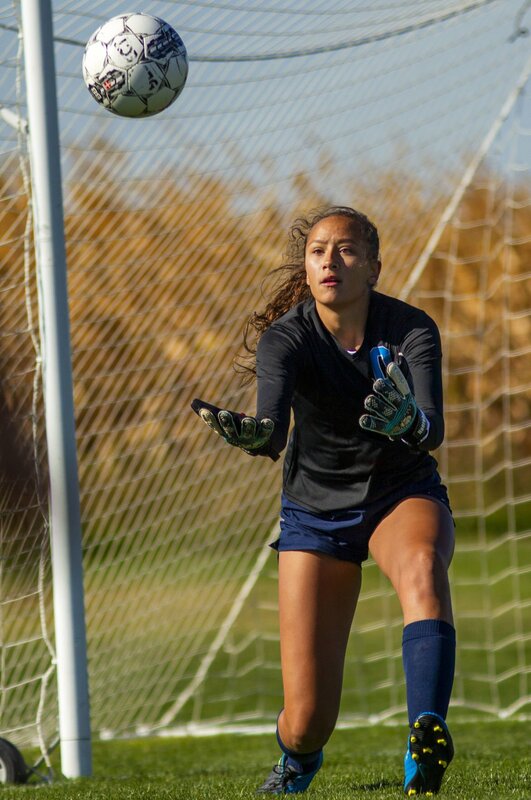 One-on-one with Twin Falls junior goalkeeper Sidnee Naerebout, Edgely kicked the first right into the goalie’s welcoming arms in the eighth minute, and the second over the bar three minutes later. Bruins head coach Katie Kauffman conceded that her team may have fallen asleep a bit after taking the early lead. The rest of the first half belonged to the Bruins, though. They picked up control of the midfield through junior Madison Bailey and her sister, freshman Kaylin Bailey. Madison Bailey said she and her sister have a strong understanding of one another because they “spend 24/7 together,” and that helped the Bruins take over the game early on. Twin Falls continued to manufacture chances, but each one failed to yield a goal. Despite a lead and a general sense of control over the game, the Bruins needed improvement, still clinging to the one-goal advantage at halftime. Madison Bailey said the coaches instructed the team to keep the ball on the ground with the influence of the wind at halftime. The players listened, and immediately generated chances. Ten minutes into the second half, it was Madison Bailey who found the finishing touch the Bruins had been looking for since Hicks’ opener, as she fired a shot from long range over the outstretched arm of Vasas and into the net. Bailey, who had attempted shots from that type of distance already, said the wind was in her favor and she hit it right on that occasion. Junior Brinlee Stotts scored the third and final goal by chipping the ball over a sliding Vasas seven minutes later. Within 20 minutes of the start of the second half, the Bruins had become more clinical in front of goal and were able to all but put away the victory. Naerebout and the defense in front of her combined to keep a fourth straight clean sheet for Twin Falls, their 13th this season. Kauffman said there were very few scary moments at the back, which was important with the unpredictability of the ball with the wind. The Bruins have won all 17 of their games since their season-opening loss to Highland. Their fourth straight district title was not as easy as the first three, either. Century, Mountain Home, Pocatello and Preston joined the GBC this season. Heading into the 4A state tournament, which begins Thursday in Coeur d’Alene, Kauffman believes her team has been on a path to peak at the right time. Twin Falls played Century in the Great Basin Conference title game at Sunway Soccer Complex in Twin Falls.